TechInAfrica – People around the world mostly use internet from two sources, WiFi or mobile networks. Usually, using WiFi is much faster than using mobile networks. At least, it commonly happens in many countries in the world. However, it does not happen in some parts of countries, including in Kenya. A research study—the State of WiFi vs Mobile Network Experience as 5G Arrives—conducted by OpenSignal, reveals some outstanding findings. The study found that mobile networks have faster speeds than WiFi in 33 countries where Kenya is included. The results were analyzed from the average download speeds taken by smartphone users experience within the countries. 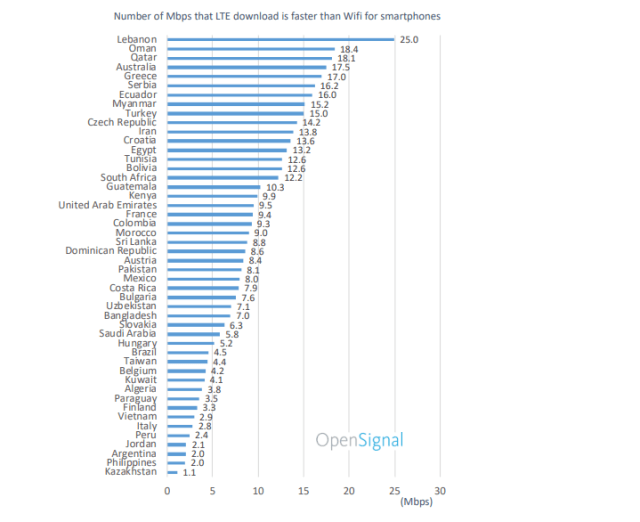 In Kenya, LTE downloads average are 9.9 Mbps faster than WiFi as for smartphones. Meanwhile, in other African countries—such as South Africa’s delta, Morocco, Algeria, and Lebanon—the LTE downloads average are 12.2 Mbps, 9.0 Mbps, 3.8 Mbps, and 25 Mbps. As it is on the list, Lebanon is the fastest. These findings if compared to the other spectrum in developed countries like in Hong Kong, Singapore, and the US, WiFi is faster than the mobile network. In these developed countries, WiFi speeds average were -38.6 Mbps, -34 Mbps, and -25 Mbps respectively. The report also points out that WiFi is not always faster than mobile network as it was in 10 years back when we only had 2G networks. After 3G, 4G, and 5G networks were found, WiFi is no longer taking the lead for internet speed. As 5G networks are on development, we are moving on to it, thus, the mobile networks will be much faster than WiFi. Many operators are targeting higher speeds, 1 – 3 Gbps where it will be significantly different from WiFi speeds in the future.